You know the feeling when you keep bumping into a new (to you!) place or idea everywhere? I keep having that feeling about Science Gallery Dublin --- it keeps popping up in conversations with colleagues, on the Web, and in radio programs. So much so, I'm saving my pennies for a visit to Dublin to see it myself. Science Gallery International was started by Trinity College Dublin in 2012 with the aim of creating a global network of Science Gallery locations in partnership with leading universities and research centers in key urban locations. It seems like the Science Gallery chooses themes, like their current show called Illusion, and then partners with all sorts of interesting folks (be they scientists, researchers, artists, or even magicians) to create dynamic displays and performances. "Blood Wars" is an edgy example from a recent show at Science Gallery about the body. Basically, blood is drawn from visitors and transferred into Petri dishes. The blood cells then "fight" each other through a series of matches that produce a "winner," but that also foster discussions about blood types, cells, and the like. 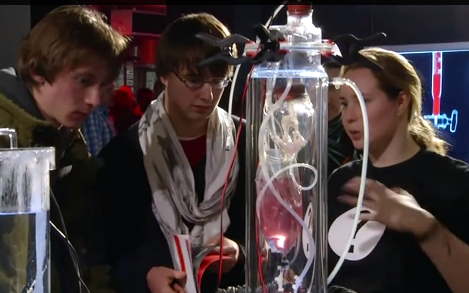 It all seems like incredibly cool stuff, and a twist on the traditional science center model. So, while I'm saving for my trip, if anyone has actually been to Science Gallery in Dublin, let us know in the "Comments" Section below!